Handprint crafts make the perfect little keepsakes. You can always remember your child's handprint with any of these 25 handprint projects. All of these crafts are easy and use simple supplies. There are animal handprints, holiday-themed handprints, and even handprints that you can give out to friends and family as gifts. Choose one or more of these to try with your family. 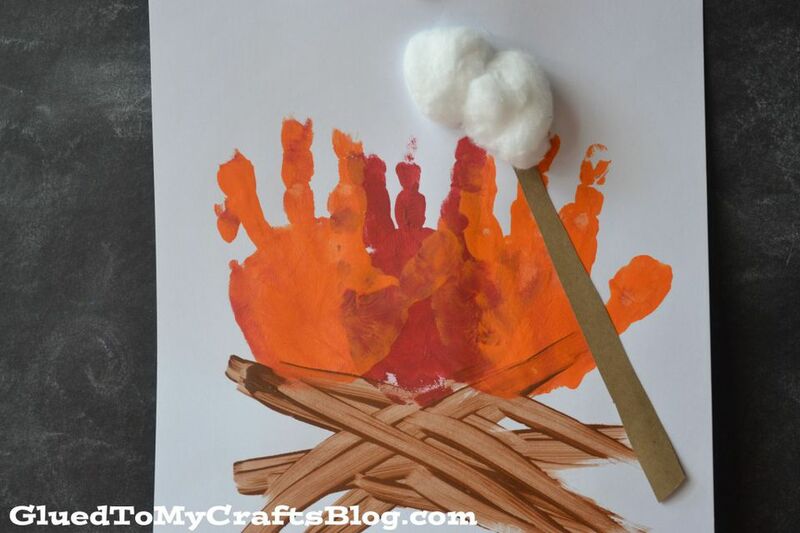 Pretend to have a campout with your kiddos by making an indoor campfire on paper. Orange handprints look just like fire flames. Use cotton balls are faux marshmallows- just don't eat them! Need an easy spring or Easter craft for your kids to do? Try this handprint chick craft. Your kids will love it! Create bird wings with handprints for this raven kids project. You could craft any bird you'd like using different colors. Grandparents would gobble up these cute turkey handprint cards from their grandchildren! These are super simple to make and a great craft for Thanksgiving time. Put them on the kids' table to keep them entertained. This tutorial shows each step in creating pretty little flamingos. All you need is your handprint and some paint. How nifty is this cheetah art made from a handprint? Your kids are going to really enjoy this art project using their hands. I love elephants. Dip your hand into grey paint to make this elephant. Add googly eyes and you're done! This is a fun craft that all kids will enjoy. There are so many beautiful colors in this handprint peacock craft. This craft makes a great keepsake that will last for years to come! Any Curious George fans out there? If so, you'll love this Curious George handprint monkey craft. It's simple and requires only a few art supplies. A green handprint creates the leaf part to this paper plate apple craft. Try this easy project with your little crafters. Be transported to the beach with this cute handprint crab craft. Use two handprints to complete this project. Fold a paper plate in half for the first step of this duck craft. Add an orange handprint for the tail of the duck. Craft these cute chicks and bunnies for the Easter holiday. The paint that you use for this craft is edible. How fun is that? Catch the sun rays through the window with this handprint sun-catcher craft for kids. It's colorful, simple, and perfect for family crafting.